Any ideas on this one - the M looks like Maltby but the other flower type mark, although similar, isnt quite the same and I cant find anything similar with such a prominent mark on the front of the piece. Interesting. It looks like a slightly transition period piece. He was a David Leach apprentice of course, and his early Stoneshill work is very strongly Leach orientated. The underlying brown glaze here is one he frequently that he used later at Stoneshill. The decoration and the glaze seems slightly diffident. His later painterly work is STRONG and BOLD and that is why people like it. This seems as though he is slightly searching in directions, which is probably what he was doing. Dating, that is difficult, John Maltby was a very individualistic potter, and attempted many different things. Mid 70's? Somewhere vaguely around there. It does not have the bold confidence of his later work, but has lost most of the Leach style. The personal mark on the front is unusual. But then mature Maltby was a very quirky and individualistic potter, which is part of his appeal. So what if he put stamp on somewhere different? If someone was going to fake Maltby, I think it would not be in this sort of style. The value of his work is in the painterly piece. It would just not worth bothering value wise in faking this piece. He had a heart attack in the early in the mid 90's, which basically made him physically incapable of the hard manual work of his 'painterly' work. We actually visited him in when we first started collecting studio pottery about 1995. We bought 3 pieces he had. Some of the last of his painterly pottery. 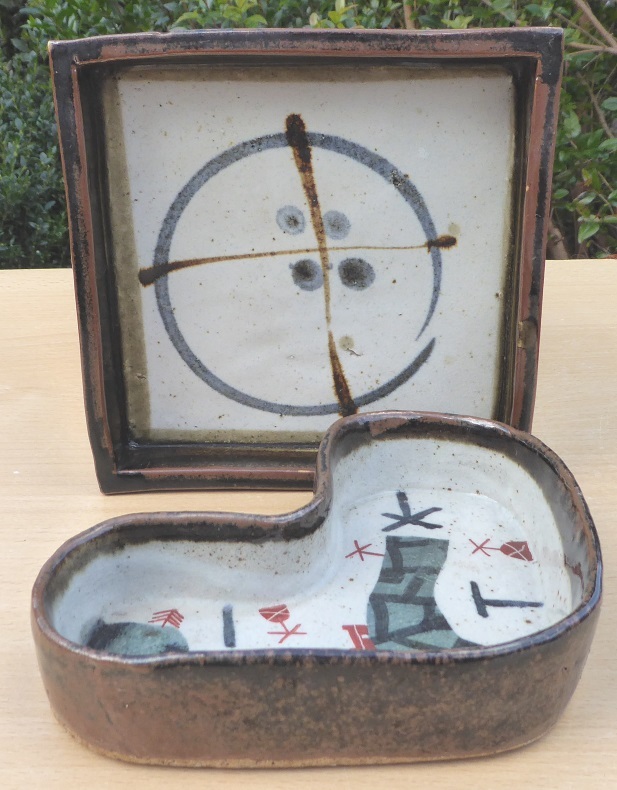 The square dish at the rear in the image below was signed plus dated 1973. So he was certainly starting to experiment at that time. He told me that he did the card/paper/wood things when he was a little short of money to buy clay and also during the winter, as if he had clay at that time it was often unusable, as it froze. He did say that he wasn't terribly keen on them but people seemed to be, which I suspect meant that he got pestered by galleries to make some more recently.